Remember episode where Rachel and Chandler stop and eat all the stolen from their neighbor’s mail-order cheesecakes ? This is exactly as I always imagined those would taste, something which makes us want to stop everything, help ourselves to another generously portioned slice, and just moan in bliss. I served it with a blackberry sauce, but honestly, this needs no accompaniment and I think it is even better plain. The texture is absolutely perfect – creamy, thick, smooth and it slices beautifully. And more as you may have noticed there is No CRACKS….Yeah! Suffice it to say, my search for the perfect cheesecake recipe ends here. For no cracks on top, this cheesecake can thank to special “water bath” bake, and this is one of the secrets to a truly creamy cheesecake. 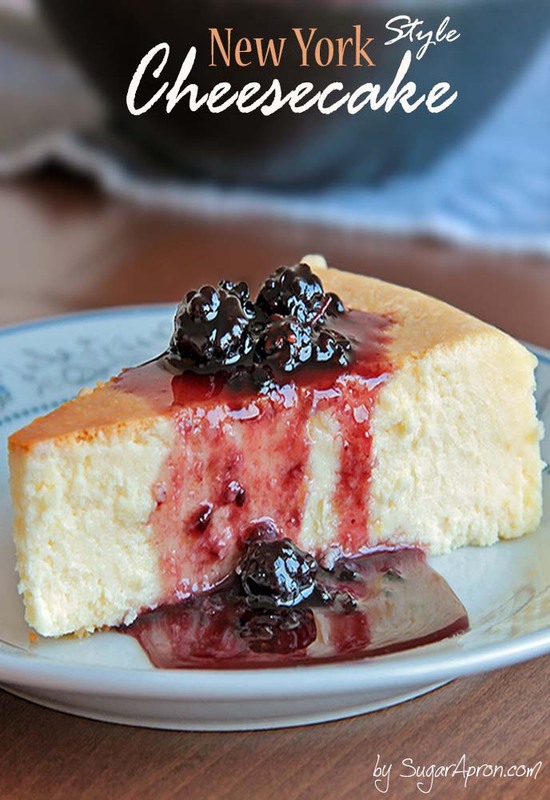 Because using the water bath method provides a more even, slower heat source than the direct heat of an oven and this is important for baking foods like cheesecakes, which tend to crack from the heat of the oven. To bake using a water bath, you will need a baking pan that is large enough to hold a springform pan (or other baking dish wrapped in foil to avoid any water from seeping into the pan which would make the cheesecake crust too wet), and is also large enough to allow for water to surround to mid of the springform pan. 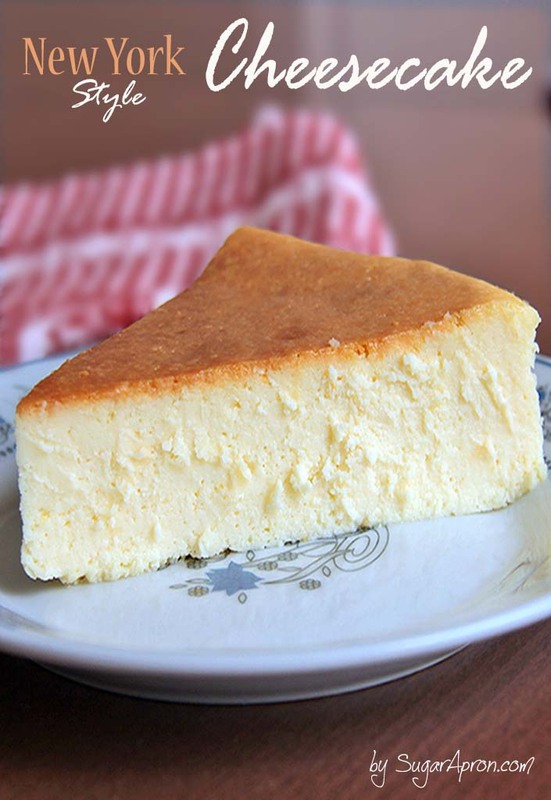 New York Style Cheesecake – Tall, creamy, thick, smooth and it slices beautifully. And more as you may have noticed there is No CRACKS....Absolutely Perfect !! Generously butter the inside of a 10-inch springform pan. Cut two large pieces of foil and lay them on your work surface in a cross. Set the springform pan in the middle and fold the edges of the foil up around the sides of the pan. The foil gives you extra protection against water getting into the pan during the water bath step. In a large mixer-bowl or bowl, beat the cream cheese and butter until it is smooth and there are no lumps. Add the sour cream,sugar,cornstarch,lemon juice, lemon zest and vanilla to the bowl and beat on medium-low speed until combined and creamy. Scrape down the beater and sides of the bowl with a spatula. Next add the eggs, one at a time, beating slowly until everything is combined. Pour into the prepared springform pan and place in a roasting pan large enough to prevent the sides from touching. Bring a few cups of water to a boil and pour the water into the roasting pan, being careful not to splash any water onto the cheesecake. Fill the pan to reach halfway up the sides of the springform pan. Bake for 2 hours, 15 minutes, or until the cake is very lightly colored and a toothpick inserted in the center emerges clean. Turn off the oven and crack the door open. Let the cheesecake cool slowly for two to three hours. Do not try to remove the cheesecake from the pan until it has set up in the refrigerator overnight or at least 6 hours. This step is crucial for letting the cheesecake set and achieving perfect cheesecake texture — don't rush it. Unmold the cake and top the cheesecake just before serving. You can either serve the cake right from the bottom of the springform pan or garnish with blackberry sauce or whatever topping you desire. I definitely am craving a slice of this cheesecake right now after seeing this post. Love a classic New York cheesecake! I have made this recipe about five times. It’s great, and everyone loves it, the only issue is; my top always comes out brown 🙁 suggestions? Thanks for the recipe. I makes three times already.My friens love. So my first time making cheesecake was with this recipe. It turned out amazing. I have to admit I freaked out when I opened the oven and the cheesecakes was over half an inch taller than my spring form pan lol. Amazing recipe thank you. Made my father’s birthday. I would like to make some mini cheesecakes from this recipe. How long and at what temperature should I bake them at? Honestly, I’ve never tried that. I assume that they will not be baked in a some sort of “water bath”, in such a case you could try baking them at 325 F for 20 to 25 minutes until center is almost set. Try baking the cheesecake in a rectangular pan. Once the cake is baked and cooled, use a cookie cutter or a knife to cut mini cakes out of the big one. I used a large heart shaped cutter to cut out mini cakes a couple years ago for Valentine’s Day and it worked great! Hola soy costarricense me podrían escribir a mi correo esta deliciosa receta. Muchas gracias bendiciones. Hello. I did this cheesecake exactly how the recipe but the top cracked in several pc in the end of the baking . Why is that ? mmm yummy…. parchment paper works or have to be foil paper? thank you. Worst cheesecake I’ve ever eaten. It’s more like a souffle. Dear Sarah, I humbly appologize. I was wrong. I tasted it before it chilled. It is by far the best cheesecake I have ever eaten. Rach and Chandler would be proud. I am running short on sour cream. Is it alright to substitute half of the sour cream with greek yogurt? ABSOLUTELY!!! Greek yogurt is about as thick as sour cream and has a similar tangy flavor. Hope y’all enjoy it!! Please come back and let me know! Can you give the Ingredients in gram please. I cant understand what the some of butter, sour cream and cheese cream. Can you give the weight of the cake ingredients in grams? I just wanted to thank you for an amazing recipe. I made it yesterday and today it turned out the most beautiful looking and tasting cheesecake I’ve had in years. Hi Toni,cheesecake leave in the refrigerator usually overnight and cover with aluminum foil. Enjoy! Mine was close to chocolate brown by the second hour in the oven. I took it out and peeled the top layer off. Any suggestions for avoiding this next time? I’m a Brit and we are knocked flat by ‘sticks’ and ‘cups’ Butter comes in 8oz blocks and cups ? what size of cup ? Help please !! Hi ! I m from Italy and IT is quite difficult even for me ! Hi, I make cheesecake all the time and had a couple of tips some might find useful. I rarely use a water bath. Instead I place a pan of boiling water on a rack beneath my cheesecake to add steam to the oven. They come out great and no chance of a soggy crust. They do not however have that lovely brown top, it stays cream colored. For those who like the traditional water bath you can use baking bags made for turkeys or roasts to put your pan into before wrapping it in foil to prevent water leaking into your springform pan. If your cheesecake is a bit over done use a spatula or knife to loosen it from the pan while it is cooling other wise cracks form as it slightly shrinks. Love the recipe and I will be making it soon. Thank you for posting it! I made this exactly as writtem, and it cooked over and cracked a ton. Haven’t eaten yet, but very disappointed. How full of batter was the pan supposed to be? Hi Sarah, I still haven’t tried doing this recipe, but I have one question: Can I just put the cheesecake into the oven without using the water bath? Thanks for the recipe, it looks great! Hi Elena!Sure, but using water bath you get juicy and soft appearance of cakes. I am Brazilian long look for a new- york cheesecake recipe. Congratulations was all I expected ..
Hi, thank you for this wonderful recipe, I have made it twice now and each time has come out beautiful, no cracks and sooo delicious my friend now beg me to make it again. So thank you again. I made this for Easter and it turned out amazing! I didn’t change anything either.. I made this cheesecake for a friend. Used all Greek yogurt instead of the sour cream. Used 7 eggs, because they were small eggs from my own chickens:) Baked it in my rice cooker instead of the oven. I had to hit the “cake” setting on my rice cooker about 3 times and after I hit it the third time, I just kept opening and checking with a toothpick for doneness. I can’t remember exactly (wasn’t paying attention) but think it took about 2 1/2 hours. Removed pan from cooker and let cook slightly, then placed in refrigerator on a wire rack overnight. Next morning inverted pan over plate and let sit. It was beautiful and delicious! The person I gifted this cake too loved it. Can’t wait to make one for myself:) Thank you. Oh, the person I made this for was diabetic and we used half Splenda and half sugar. I always just use sugar, but she said it worked great. Best cheese cake ever. Making it for a second time. The recipe looks great. I really want to try it, but in a smaller portion. Do you think i could half the ingredients for half the size cake? 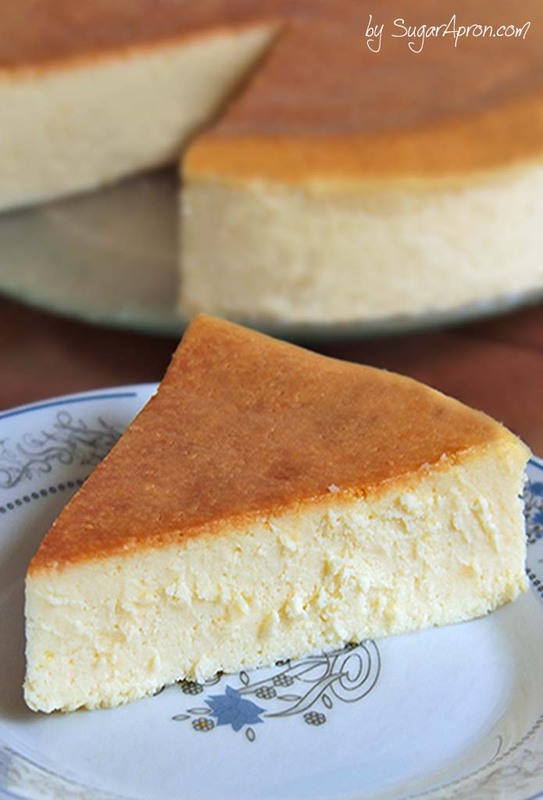 I’ve made this cheesecake several times and it is always a big hit! Can you tell me if it is gluten free if not how I can convert it to gluten free?